And you know what? The battle doesn’t get easier to manage as time goes by. Especially if you don’t know who you are. If not careful to understand the time & place for each and how they impact YOU, you will be lost. How ironic to have to think & feel to know, when to feel vs. think and think vs. feel. It’s annoying. Even Superheros get confused and mix it all up. I mean just watch any Superman movie. After the heart wants something so deeply which it can not have, by the time the brain catches up and absorbs this, there’s quite a mess left to clean up. Having said that, I’m slowly cleaning it up. There is hope for me yet! Not always easy when impatience enters the equation. And I go get impatient. Quite frequently. Realizations occur when you least expect them and when they do, you just want to get on with it. 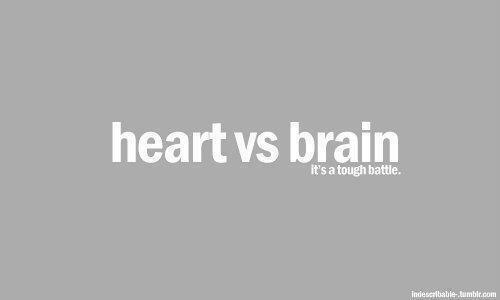 BUT, again, what you realize in your brain as the rational thing to do, isn’t always cohesive for your heart.